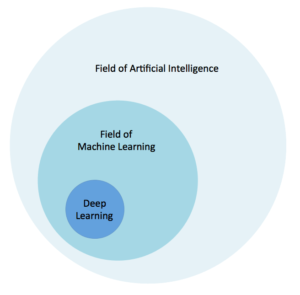 With the rise in popularity of artificial intelligence, there are three terms many people tend to use interchangeably: artificial intelligence (AI), machine learning (ML) and deep learning (DL). While AI, ML and DL are related to each other, they aren’t exactly the same thing. Nor are they completely separate things. To break down how these three terms relate, let’s start with some definitions. Artificial intelligence is the science and engineering of making intelligent machines that have the ability to achieve goals like humans do. Machine learning is a current application of AI that gives computers the ability to learn without being explicitly programmed. Deep learning is a technique to implement Machine Learning. Now let’s look at how these three concepts relate to each other. The Skymind,ai blog puts it this way: “You can think of deep learning, machine learning and artificial intelligence as a set of Russian dolls nested within each other, beginning with the smallest and working out. Now let’s look at a few examples of each. One famous deep learning example is the Google DeepMind AI program AlphaGo, which in 2016 beat out world champion Lee Sodol at the ancient and complex game of Go. Another deep learning example is Kavout’s pattern recognizer. 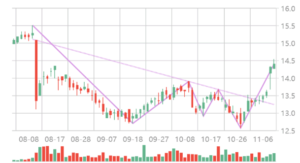 It identifies whether a given stock price has shaped a certain pattern indicating possible trading events. For example, technical traders use chart patterns such as the one to the right to make buy/sell decisions. Deep learning technique is used here because it doesn’t require feature definition as an input. The convolutional neural network (CNN) model automatically recognizes features that are relevant and important for classification and generates results that are more accurate. In contrast to that, a typical ML model has its limitations as feature definitions need to be pre-defined and fed into the model. The system then identifies which features are more important in classification. There are numerous examples of how machine learning is already being used by companies many of us interact with regularly. Netflix uses machine learning algorithms to make video recommendations and to improve streaming quality. At Kavout, when we were building the Kai Enhanced Portfolio, we applied machine learning techniques like tree clustering methods to group similar investments into clusters based on their correlation matrix in order to fully diversify assets for risk control. In addition to machine learning, the field of AI also includes natural language processing (NLP), speech, expert systems, planning, scheduling and optimization, robotics and vision. Speech recognition is already a part of many of our lives with a wide spread usage of Apple’s Siri, Google Home, and Amazon Echo. Some examples of NLP that you may already see in your email provider are predictive typing, which suggests the next word in a sentence, and text classification, which Google and other email providers use it to determine if an email is spam or not. As you can see, the terms artificial intelligence, machine learning and deep learning are related, but perhaps not in the way you imagined. Regardless, AI, ML, and DL will clearly be more a part of our lives, so it’s good to get acquainted with the terms and understand how and where they may be used.